As 45 Long Colt has seen a resurgence in popularity due in part to cowboy action shooting competitions Fiocchi has stepped up to the plate delivery quality ammunition to serve this need. 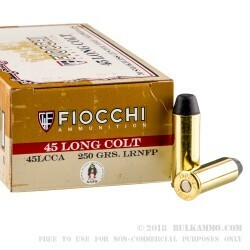 Fiocchi's 45 Long Colt ammo features a 250 grain lead round nose projectile with a flat point profile that exits the muzzle at approximately 750 feet per second with a relatively light recoil. 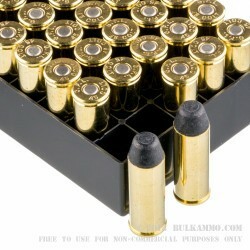 This ammo features quality brass well built to get multiple reloads out of it. 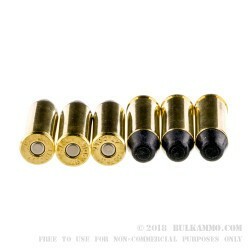 This ammo is boxer-primed and non-corrosive featuring modern smokeless powders that run a little dirty but nothing a good cleaning can't fix given the affordable price point Fiocchi sells these at.